The students create their own Native American Names while studying about Native Americans. We use toilet paper rolls to create a body for our Kachina Dolls, or "mini-native americans". Construction paper is used for the rest of the body. Every student picks a native american name that reflects their individual personality, such as "Beautiful Meadow" or "Swimming Sky". 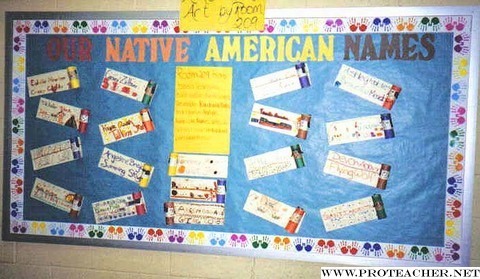 On cardstock, each student displays their real name, followed by their native american name. They put the finishing touches on their name cards, and we have a wonderful display that teaches others about native americans and ourselves!